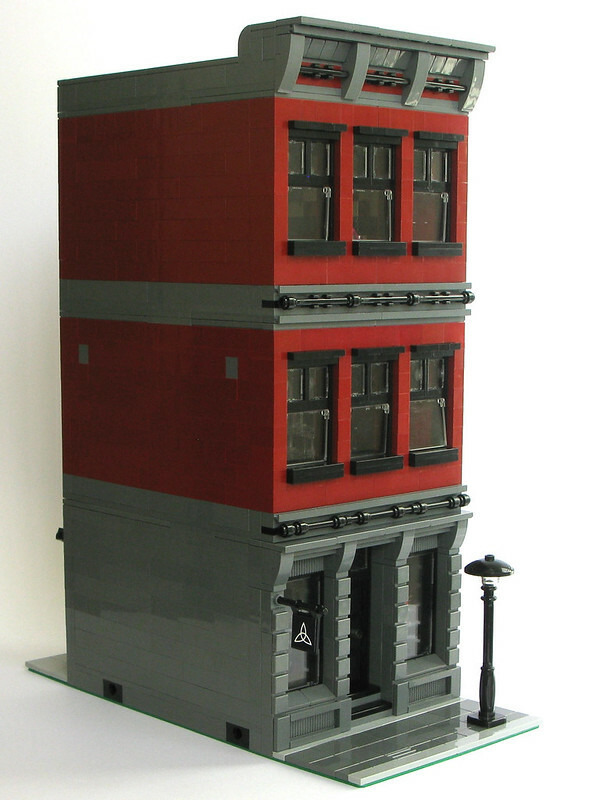 With a bar, perfumery, ice cream parlour and clothes store, this modular building by BrickShelf user Pikey1984 has a something for everyone. If you can get past the elephants guarding the front entrance! The rear boasts a beautiful outdoor seating area, complete with ‘rock’ filled planters. In addition to the elephants guarding the front entrance, Pikey1984 has hidden two more elephants in plain sight. Head over to BrickShelf to find them. The features on theLET’s Modular Bar that immediately caught my eye were the angled columns on the roof, the cute shutters on the windows and the neat little outdoor seating arrangements. However, it’s the rafters and chandelier in the roof that steals the show for me. This shot of the interior of the roof also reveals some of the interesting building techniques that theLET has used to create this little gem. More images available on theLET’s BrickShelf folder. I’d like to present my latest modular building, the Trilogy Bar and Nightclub. It features three floors for three different moods – drinking, dancing or just lounging! This building holds some sentimental value to me as the bulk of the facade on this building was one of the first builds I ever did. But it was never shared publicly because I didn’t like the building as a whole (it was originally a 24-stud wide fire station). I kept coming back to it and decided the only way I was going to like it was if it was an entirely differently-purposed building. I still want to try my hand at a fire station, but that will have to wait for another day. See here for more about the Trilogy!